As a means of recording the passage of time, the 14th century was a century lasting from January 1, 1301, to December 31, 1400. During this period, political and natural disasters ravaged both Europe and the four khanates of the Mongol Empire. Consequently, the Mongol court was driven out of China and retreated to Mongolia, the Ilkhanate collapsed in Persia, the Chaghatayid dissolved and broke into two parts, and the Golden Horde lost its position as a great power in Eastern Europe. In Europe, the Black Death claimed between 75 and 200 million lives – wiping out over 60 percent of European society – while England and France fought in the protracted Hundred Years' War after the death of Charles IV, King of France led to a claim to the French throne by Edward III, King of England. This period is considered the height of chivalry and marks the beginning of strong separate identities for both England and France. Filippo Brunelleschi, the Italian architect who by many is regarded as the most inventive and gifted designer in history. 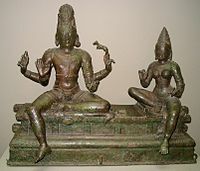 This 14th-century statue from Tamil Nadu, present day India depicts the gods Shiva (on the left) and Uma (on the right). It is housed in the Smithsonian Institution in Washington, D.C.. The transition from the Medieval Warm Period to the Little Ice Age. Beginning of the Ottoman Empire, early expansion into the Balkans. Early 14th century: Attributed to Kao Ninga Monk Sewing is made. Kamakura period. It is now kept at The Cleveland Museum of Art. An account of Buddha's life, translated earlier into Greek by Saint John of Damascus and widely circulated to Christians as the story of Barlaam and Josaphat, became so popular that the two were venerated as saints. Iwan vault, Jamé Mosque of Isfahan, Isfahan, Persia (Iran), is built. Work begins on the Great Enclosure at Great Zimbabwe, built of un-cemented, dressed stone. The city's population is now between 10,000 and 40,000. 1309 — King Jayanegara succeeds Kertarajasa Jayawardhana as ruler of Majapahit. 1318-1330 — An Italian Franciscan friar, Mattiussi visited Sumatra, Java, and Banjarmasin in Borneo. In his record he described the kingdom of Majapahit. 1323 — Malietoafaiga ordered cannibalism to be abolished in Tutuila, now known as American Samoa. 1328 — Tribhuwana Wijayatunggadewi succeeds Jayanegara as ruler of Majapahit. 1335 — The death of the Ilkhan Abu Said, causes the disintegration of the Mongol rule in Persia. 1337 — The Hundred Years' War begins when Edward III of England lays claim to the French throne. 1345–1346 — The French recruit troops and ships in Genoa, Monaco, and Nice. 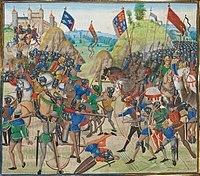 The Hundred Years' War, Battle of Crécy between the English and French in 1346. 1346 — English forces led by Edward III defeat a French army led by Philip VI in The Battle of Crécy, a major point in the Hundred Years' War which marks the rise of the longbow as a dominant weapon in Western Europe. 1347–1351 — The Black Death kills around a third of the population of Europe. 1347 — Adityawarman moved the capital of Dharmasraya and established the kingdom of Malayupura in Pagarruyung, West Sumatra. Burying coffins of Black Death victims in Tournai. 1350 — Hayam Wuruk, styled Sri Rajasanagara, succeeds Tribhuwana Wijayatunggadewi as ruler of Majapahit; his reign is considered the empire's 'Golden Age'. Under its military commander Gajah Mada, Majapahit stretches over much of modern-day Indonesia. 1356 — The Imperial Diet of the Holy Roman Empire headed by Emperor Charles IV issues the Golden Bull of 1356, establishing various constitutional aspects of the Empire, the most significant being the electoral college to elect future emperors. 1356 — The Diet of the Hansa is held in Lübeck, formalising what up until then had only been a loose alliance of trading cities in northern Europe and officially founding the Hanseatic League. 1357 — Scotland retains its independence with the signing of the Treaty of Berwick, thus ending the Wars of Scottish Independence. 1357 — In the Battle of Bubat, the Sundanese royal family is massacred by the Majapahit army by the order of Gajah Mada; the death toll includes Sundanese king Lingga Buana and princess Dyah Pitaloka Citraresmi, who committed suicide. 1363 — The Battle of Lake Poyang, a naval conflict between Chinese rebel groups led by Chen Youliang and Zhu Yuanzhang, takes place from August to October, constituting one of the largest naval battles in history. 1365 — The Old Javanese text Nagarakertagama is written. 1366 — Tepanec Tlatoani Acolnahuácatl accepts Acamapichtli as the first tlatoani of Tenochtitlan for the Mexica Empire. 1368 — The end of the Mongol Yuan Dynasty in China and the beginning of the Ming Dynasty. 1377 — Majapahit sends a punitive expedition against Palembang in Sumatra. Palembang's prince, Parameswara (later Iskandar Syah) flees, eventually finding his way to Malacca and establishing it as a major international port. 1378 — The Great Schism of the West begins, eventually leading to 3 simultaneous popes. The Portuguese interregnum, Battle of Aljubarrota between the Portuguese and Castilians in 1385. 1381 — John Wycliffe is dismissed from the University of Oxford for criticism of the Roman Catholic Church thus, the Lollardy movement rises in England. 1381 — Peasants' Revolt in England. 1385 — Battle of Aljubarrota between Portugal and Castile. Portugal maintains independence. 1385 — Union of Krewo between Poland and Lithuania. 1389 — Battle of Kosovo between Serbs and Ottoman Turks, Prince Lazar, sultan Murat I and Miloš Obilić were killed. 1389 — Wikramawardhana succeeds Sri Rajasanagara as ruler of Majapahit. 1392 — Taejo of Joseon establishes the Joseon Dynasty. 1397 — The Kalmar Union is established, uniting Norway, Sweden and Denmark into one kingdom. Guillaume de Machaut (at right) receiving Nature and three of her children, from an illuminated Parisian manuscript of the 1350s. Mansa Musa (d. 1337), King of the Mali Empire. During his reign Mali was the source of almost half the world's gold. Hongwu Emperor (1328–1398), founder of the Ming dynasty in China. Osman I (1258–1326, Osman Gazi or Osman Bey or I.Osman or Osman Sayed II) leader of the Ottoman Turks, founder of the dynasty that established and ruled the Ottoman Empire. Robert the Bruce (1274–1329) King of Scotland, victor in the First War of Scottish Independence against invasion by the Kingdom of England. Edward II (1284–1327?) of Caernarfon, was King of England from 1307 until he was deposed in January 1327. Roger de Mortimer, 1st Earl of March (1287–1330) an English nobleman, was for three years de facto ruler of England, after leading a successful rebellion against Edward II. Charles I of Hungary (1288–1342) military, diplomatic and financial reformer, restoring the Kingdom of Hungary to power. Ivan I of Moscow (1288–1340) called The Moneybag, was Prince of Moscow, who made his principality most powerful state in Russia. Isabella of France (c. 1295–1358) queen consort and regent of the Kingdom of England. Stephen Uroš IV Dušan of Serbia (1308–1355) Emperor of the Serbs and Greeks. Casimir III of Poland (1312–1377) expansionist and financial reformer. Joan of the Tower (1321–1362) a.k.a. Joan of England, was the first wife and Queen consort of David II of Scotland. She was born at the Tower of London and was the youngest daughter of Edward II of England and Isabella of France. David II of Scotland (1324–1371) King of Scots, son of King Robert the Bruce by his second wife, Elizabeth de Burgh (d. 1327), was born at Dunfermline Palace, Fife. Edward III (1327–1377) King of England. His claim to the throne of France resulted in the Hundred Years' War. Edward, the Black Prince (1330–1376) or Edward of Woodstock, Prince of Wales, KG, was the eldest son of King Edward III of England and Philippa of Hainault, and father to King Richard II of England. Philip VI of France (1293-1350), called the Fortunate, was King of France from 1328 to his death and was the first king of France from the House of Valois. John II of France (1319-1364), called the Good, was King of France from 1350 to his death and a member of the House of Valois. Charles V (1338–1380), called the Wise, was King of France from 1364 to his death and a member of the House of Valois. Charles VI of France (1368-1422), called the Mad, had a reign troubled by his controlling uncles during his minority and Charles' bouts of insanity, was King of France from 1380 to his death and a member of the House of Valois. Charles IV (1346–1378) King of Bohemia, one of the most powerful men in Europe. Dmitry I of Moscow (1350-1389), Grand Duke of Moscow. His nickname, "Donskoy" (i.e., "of the Don"), alludes to his great victory against the Tatars in the Battle of Kulikovo (1380) which took place on the Don River. Richard II (1367–1400) was the King of England from 1377 until he was deposed in 1399. Tvrtko I (1338-1391) was the ban of Bosnia from 1353–1377 and later the king of Bosnia, from 1377-1391. ^ Macdonnel, Arthur Anthony (1900). " Sanskrit Literature and the West.". A History of Sanskrit Literature. New York: D. Appleton and Co. p. 420. ^ Drs. R. Soekmono; et al. (1988) . Pengantar Sejarah Kebudayaan Indonesia 2, 2nd ed (5th reprint ed.). Yogyakarta: Penerbit Kanisius. p. 72. Wikimedia Commons has media related to 14th century.